Note: if you’re having trouble viewing the 360-degree video, make sure your browser supports HTML5. About 60 feet below the intersection of Wilshire and La Brea — far from public view — a space-age scene is unfolding: final preparations are being made to launch the two massive tunnel boring machines that will dig the twin tunnels that will carry the subway to the Miracle Mile, Beverly Hills, Century City and Westwood. In the above 360-degree video, we’re mostly looking at the trailing gear of one of the two TBMs that will do the work. The video should allow you to thumb around to the right and left and enjoy views in every direction (if you have problems in Chrome, try Safari as your browser). As for the tunneling, it’s done at the front of the machine with the ‘cutter head’ — not shown here — while the trailing gear follows behind, carrying the electrical, mechanical and guidance systems for the earth-munching machines. Excavated soil and rock will be sent through the trailing gear on a conveyor system and then brought up to the surface to be trucked away. 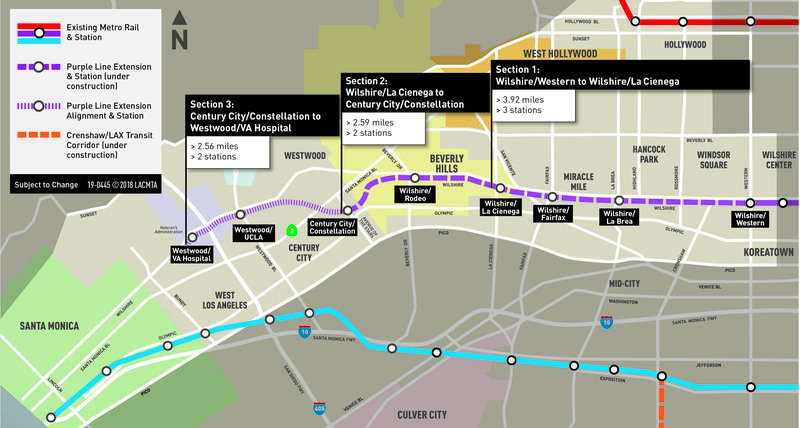 The Purple Line Extension will extend the subway for nine miles from its terminus at Wilshire/Western to the Westwood/VA Hospital. The project is being built in three sections: with the first two under construction. The first section is forecast to open in late 2023. Section One is mostly funded by the Measure R sales tax measure approved by L.A. County voters in 2008 and federal funds. Here’s the project home page. I’m almost positive that the underground area adjacent to the La Brea Tar Pits is deeper than the sixty feet the tunnels will be passing thru is made up of water and the thick tar like substance that is visible within the park. As a MTA Supervisor I was called out to evaluate safety hazards, oily tar, escaping thru the Wilshire Bl. asphalt on the south side of the street on several occasions.